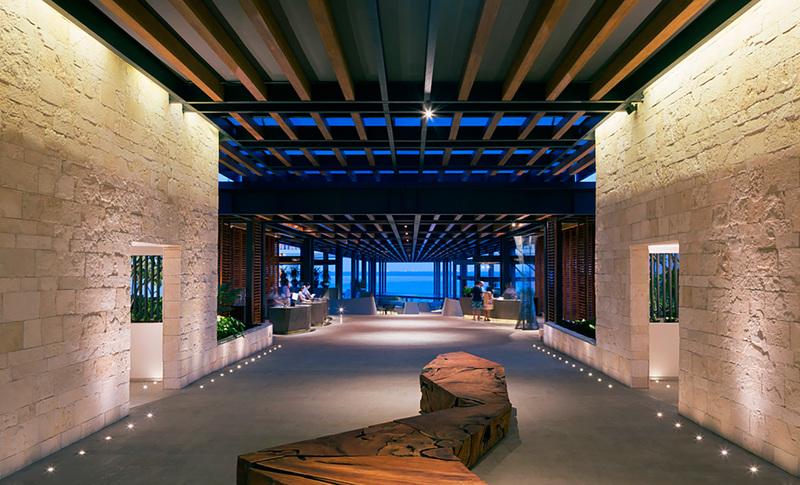 As one of the fastest-growing tourist destinations in the Mexican Caribbean, the paradise-like Playa del Carmen makes a great leap forward with the development of the Hotel Grand Hyatt Playa del Carmen, with architectural and interior design by Sordo Madaleno Arquitectos. 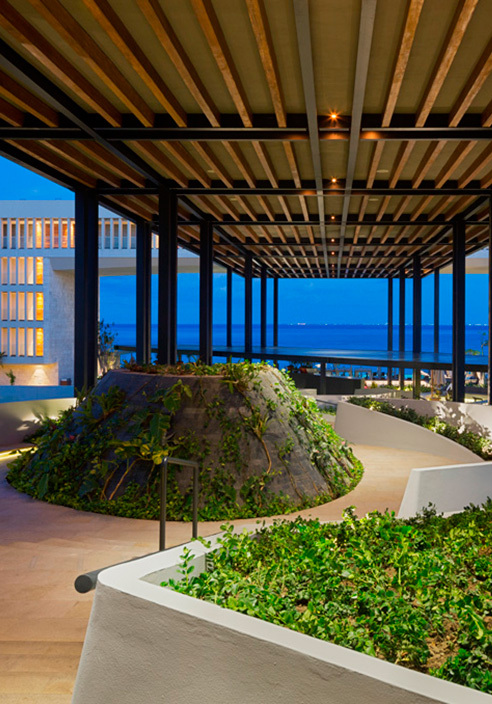 This project, in the heart of Playa del Carmen, is located on an irregular site that slopes down to the sea, with a 140-meter beachfront and a significant area of natural mangrove to be preserved. A series of studies of distribution, land use and protection of the natural area led to the development of an architectural program divided into three blocks. Each block is designed with a different intention and purpose to generate a wide range of sensations, routes and experiences for guests or visitors. The first block forms the connection between the avenue and the hotel, creating an interior roadway for pedestrians and vehicles lined by retail stores, generating an informal urban ambience recalling that of the famous 5th Avenue. This indoor street ascends to define the access route to the main plaza, which becomes the motor lobby. Taking advantage of this elevation, the ballrooms are located beneath the plaza, while the back of house areas are located underneath this indoor street. 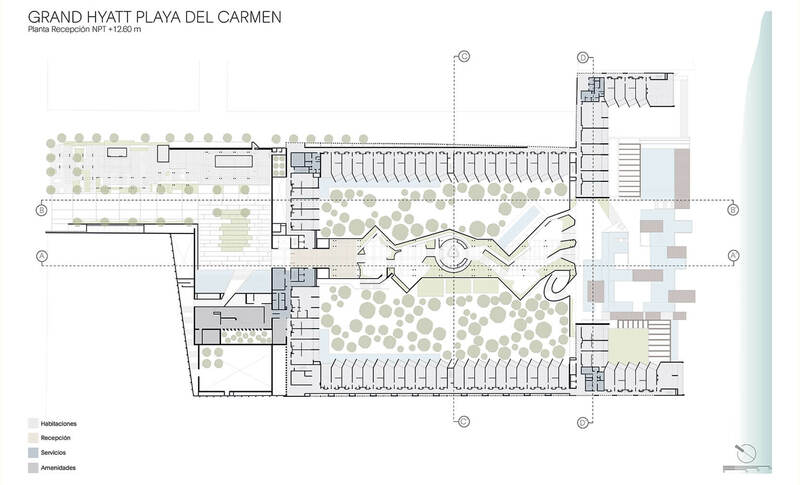 The second block is located at the center of the site, forming a visual and spatial connection between the various elements. It takes a rectangular shape, surrounded by a four-story block of hotel rooms. Inside are the fabulous mangrove gardens, which are preserved and used to create a central garden, the perfect setting for the surrounding rooms. Above this garden and right at the center of the second block there is an open covered pedestrian walkway called “el paseo”, that provides a stepped transition from the entry to the ocean with sculptural design, such as seating and kiosks, appear as though they’ve been carved out of one large stone eroded by sand and water. The space beneath the paseo is employed for the meeting rooms and the SPA. A large curved, conical, stone-clad volume rising from the earth is the main visual element related to the spa. 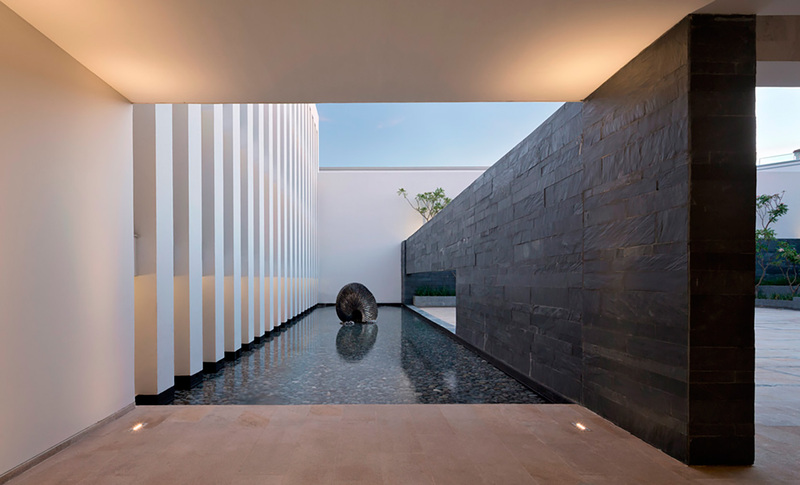 Its design alludes to the magnificent cenote pools which are a deep natural pit unique to this area, offering beams of sunlight to the Spa below. 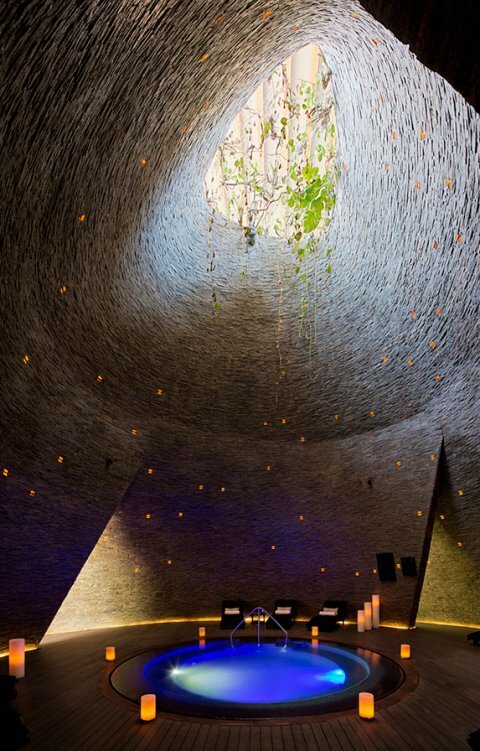 Inside the cenote you find yourself at an expansive, peaceful space is provided for guests to relax. Beyond the cenote’s top, guests descend a ramp and arrive at a large area that features kiosk that serve different kinds of refreshments one might find in a traditional Mexican market, such as agua fresca. As the closest to the sea, the third block offers the best views, which are shared with the rest of the site and enhanced with a striking 12-meter high window that spans 55 meters wide. This final block is the heart of the hotel and accommodates the entertainment amenities and restaurants, with the advantage of the direct contact with the beach. 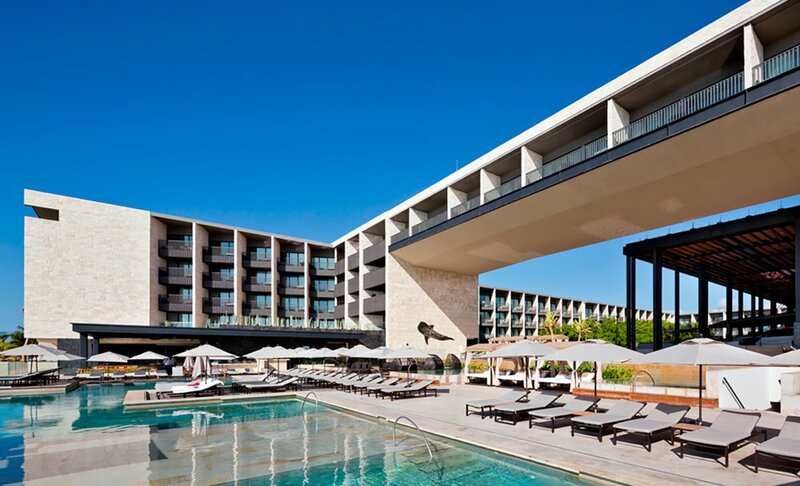 The pools and terraces surround the four-story building providing the rooms and suites with the best views. 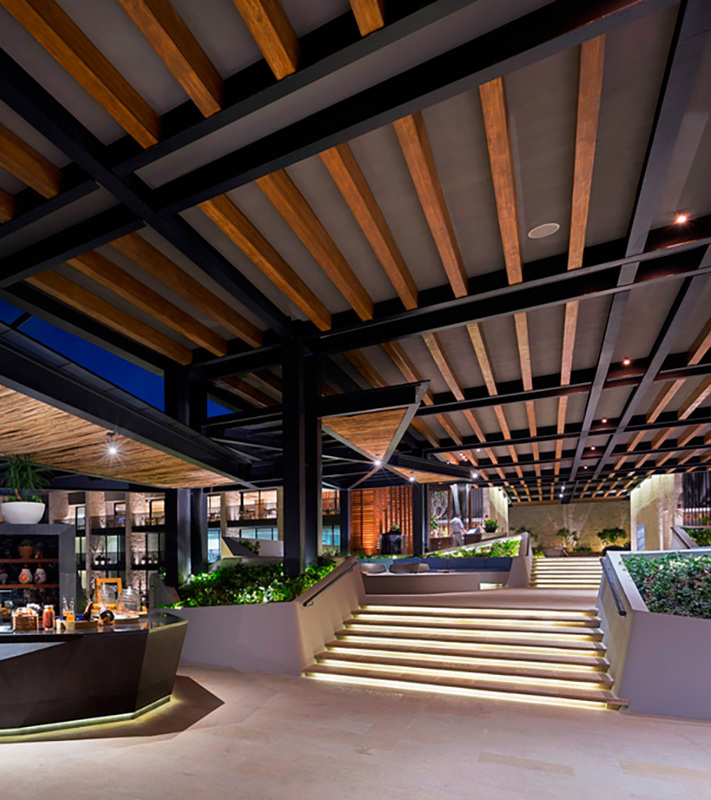 The selection of materials and finishes was based on adaptation to the surroundings, with sand-colored cladding and stone, extensive use of natural wood, native vegetation, water bodies, and warm, indirect lighting, among other details. The project’s largest and most significant spaces were purpose-designed to showcase artworks. The concept of this art was worked on in conjunction with the artist César López-Negrete, and his pieces were specifically created for this project. 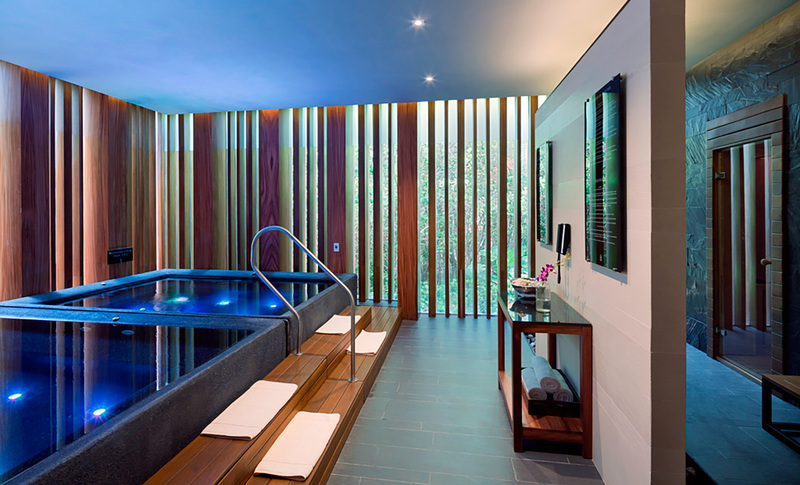 Sordo Madaleno Arquitectos was responsible for the complete Architectural design and the interior design of the SPA, pools, fitness center, Grand Club lounge, the brides room and the back of the house. Rockwell Group designed the interior of the ballrooms, meeting rooms, two signature restaurants and the kiosks. Together, Sordo Madaleno with Rockwell Group designed the paseo, guestrooms and suites.